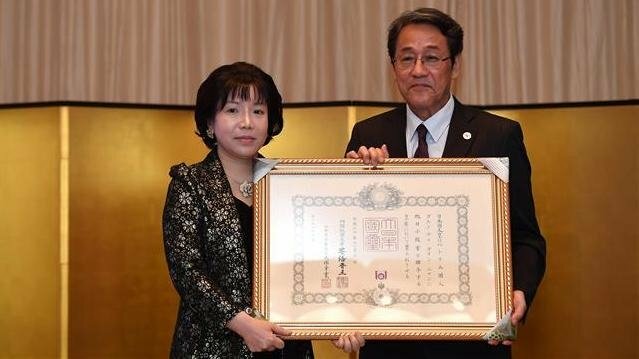 At a recent award ceremony in Hanoi, Lijima Isao, Special Advisor to the Japanese Cabinet, said the 49-year-old academician is the youngest awarded with the order since 1875. As Chairwoman and CEO of the AIC, Nhan has supported the Japanese eloquence contest over the past 16 years, creating opportunities for 700 Vietnamese students to visit Japan. Her company has hosted cherry blossom festivals in many cities and provinces across Vietnam, thus boosting Vietnamese people’s understanding about Japan and their sentiments towards the nation, as well as Japanese investment in Vietnam. A Vietnam-Japan investment conference annually held by AIC has attracted the participation of hundreds of Japanese businesses and witnessed the signing of numerous memoranda of understanding on cooperation in the fields of tourism, health, education, environment and hi-tech agriculture. Nhan’s tireless efforts over the past five years have been reflected through Japanese businesses’ investment results in Vietnam, said Japanese Ambassador to Vietnam Umeda Kunio, citing data from the Japanese Government as saying Japan poured 9.1 billion USD in Vietnam in 2017 and 6.5 billion USD in the first half of this year, ranking first among countries and territories investing in the Southeast Asian nation. He expressed wish to continue receiving Nhan’s assistance to further develop the ties between the two countries. Earlier this year, Nhan received “the world’s best smart nation concept and model” award at the Global Smart Cities Contest – London 2018.